The Jainas, followers of Jaina, observe this day as the anniversary of Lord Vardhamana Mahavira, the 24th Tirathankara, who flourished in the sixth century B.C., while Lord Buddha was also propagating his new religion, Buddhism. On this day, pilgrims journey to the ancient Jaina shrines at Girnar and Palitana in Gujarat to observe the religious festival. In every town where there is a Jaina temple, the idol of the divinity is taken out in a procession in charming wooden cars in the streets. Local fairs and fasting take place, and Smayak Sutra, a Jaina scripture, is recited continuously made by all. Source: Festivals of India by Brijendra Nath Sharma. New Delhi: Abhinav, 1978, p. 37. Celebrated throughout India, this festival commemorates the birth of Shri Rama, born to King Dasharatha of Ayodhya of the ninth lunar day in the bright fortnight of Chaitra. Observed with sanctity and fasting. Temples are decorated, religous discourses held and the Ramayana, the life story of Rama, is recited in every Hindu home. Worshippers rotate the rosary, repeating his name to free themselves from the cycle of births. During the time of the blossoming cherry trees, a festive viewing of the cherry blossoms occurs at many sites throughout Japan. This is a month of celebrations. 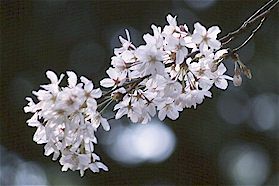 During this month, some place in Japan is having its cherry season, as there is two to three weeks difference in the climate of southwest Japan and northeast Japan. The people spend anywhere from one to seven days visiting parks, shrines and hillsides. The most visited places are Arashiyama and Kiyomizudera in Kyoto, and Yoshino near Nara. Under the cherry trees, the people eat, drink and are enjoy. The Cherry Dance comes during the season when the blossoms are at their best, but the famous cherry dance in Kyoto is set for the month of April each year. In Japan it is called the Miyako Odori, or the dance of the capital. In Tokyo, Osaka, and all places where there are geisha, there is a cherry dance at this time of year. Source: Japanese Festival and Calendar Lore, by William Hugh Ershine. Tokyo: Kyo Bun Kwan, 1933, pp. 59-60. Photo by Glen Hughes, Range of Vision, Wanderings - Japanese Cherry Blossoms. The Micronesian New Year on Satawal is signaled by the position of the star Na and the new moon. Na, the storm star forming the dorsal fin of Cu, the Dolphin, had finished storming as the new moon appears in the evening sky. The end of the fighting of Na heralded the beginning of leraak, "the year." Source: The Last Navigator by Stephen C. Thomas. New York: Henry Holt, 1987, p. 92. Family graves are visited on this day. The grave site is tended; paper money, artifacts and incense sticks are burnt; and tribute is paid to the dead. The family shares a picnic on the gravesite. The grave is then cleaned and new trees or flowers are planted. Ch'ing Ming, meaning "clear and bright," refers to the weather at the time of the year when most Chinese go to visit their family graves. Weeds are cleared way and inscriptions repainted. Incense sticks and red candles are lit and rice, wine, tea and many other foods are set out. Paper clothing and spirit money are burnt and everyone kneels to pay to respects. This is followed by a family picnic, then concluded by the tucking of paper under the stone on the grave, signifying that the grave has been tended to for another year. Graveyards in the suburbs are visited by people of all ages as they weed and repair the graves and plant trees around the gravesite. On Cold Food Day in ancient times people refrained from making a fire all day long, eating only cold food. The legend behind this … Long ago in China in the Kingdom of Chin there lived a loyal subject named Kai Ja Chu. The treacherous retainers hated him and drove him out of the king's presence. He ran far away and hid in the Chinshan mountain. The King, hearing of this, admired Kai Ja Chu's loyalty, but was unable to find him after much searching. At last he learned that Kai Ja Chu was hiding in a cave in the mountain and so he set fire to the forest to force him out. Chu did not come out so suffocated to death. So out of pity and admiration for his fidelity, all the people throughout the country refrained from making any fire to cook their food; and ate only cold things in the memory of his sad end. In due course, this custom was brought to Korea. Other customs include planting trees and eating special dough cakes made with azalea flowers. The day is computed as being one hundred and five days after Tong-ji, the winter solstice. Sources: Korean Works and Days, First Edition by Richard Rutt, Rutland, VT.: Charles E. Tuttle, 195, p. 225. Folk Customs and Family Life by Tae Hung Ha. Seoul, Korea: Yonsei, 1963, pp. 25-27.